In Team Sonic Racing, set to arrive sometime this upcoming winter on PS4, Xbox One, Switch, and PC, players race along tracks in a Grand Prix as one of four separate three-character squads. The winning side is determined by the total points earned across the entire group. It’s an interesting twist, but in the handful of races I played it didn’t feel like enough to warrant Sonic getting back into an off-brand blue Corvette. The course I got to play at E3 was a nondescript track circling a giant tree. No real environment hazards, crazy loops, or interesting obstacles. Just lots of soft turns perfect for pulling the left trigger, drifting through until I was practically perpendicular, then slingshotting myself forward with a nice boost. The previous Sonic All-Stars racing games were mostly an approximation of Mario Kart filled with generalized Sega fanservice. Team Sonic Racing is more narrow in its ambitions, focusing just on Sonic’s friends and frenemies while improving the game’s underlying mechanics. 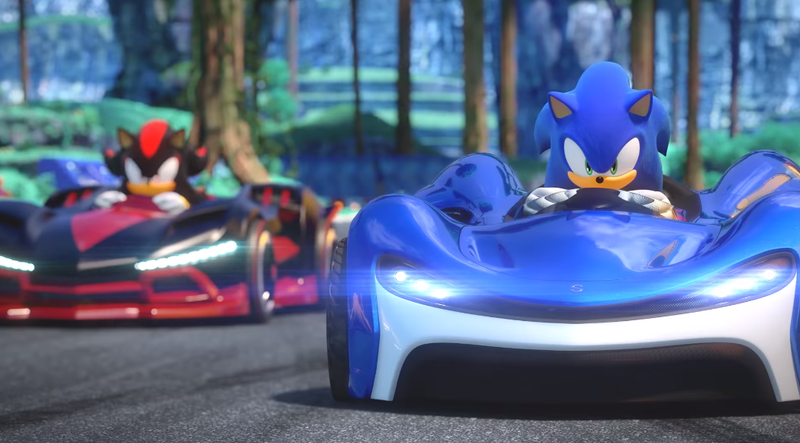 Based on my time with the demo, developer Sumo Digital has made something whose fundamentals so closely approximate Mario Kart’s it’s hard to even consider them competitors. In addition to being a Sonic spin-off, Team Sonic Racing might as well be an offshoot of Nintendo’s racing series as well at this point. In the pursuit of being a better racing game, it also feels like it’s fallen into normcore. What surrounds those fundamentals is far from flashy and, based on the demo at least, pretty underwhelming. Team Sonic Racing has 15 characters, six of which were playable for me: Sonic, Shadow, Tails, Knuckles, Rouge, and Omega. Each had different stats: acceleration, speed, defense, handling, etc. But while hedgehogs Sonic and Shadow are supposedly the fastest, and characters like Knuckles and Omega prioritize defense, the differences didn’t feel pronounced enough in practice. Each stat goes from one to 10, but most characters’ numbers in each category hovered around the midway point, never going more than two points beyond or below it. 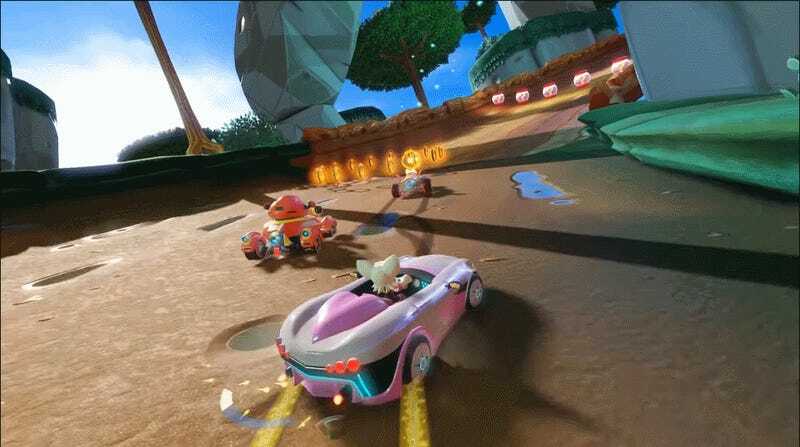 The finished game might allow a much greater amount of customization and diversity, but what I played all felt very similar, whether I was barreling down a dirt path in Rouge’s bubblegum pink car or Knuckle’s red tank-like dune buggy. In addition to determining who wins, the team racing dynamic also affects the moment-to-moment action by giving certain people boosts, letting players on the same team share items, and building up an ultimate meter that, when deployed, gives the entire team a speed boost and invincibility. The catch is that these interactions require you to be around other drivers, which you aren’t always. Shooting someone with a Crimson Wisp or driving super close to a teammate to give both of us a boost is only possible when you’re climbing the ranks or knocked back down to the back of the pack. But on single-player, at least, you’ll likely be doing your best to stay in first place, and as a result your AI friends will be left to fend for themselves, making the team driving aspect feel kind of moot. I won every race but one, and even then my middling finish was enough to get us close to a tie on overall points. Maybe the demo just wanted me to feel empowered, or maybe Team Sonic Racing is just going to be kind of a snooze on the standard difficulty. The range of items, called “Wisps,” was also pretty disappointing. Some Wisps are still just the equivalent of Mario Kart’s shells while others yield mushroom-type speed boosts or act like exploding Bob-Ombs. It all makes for a pretty bleak buffet amidst the otherwise good handling of the vehicles and drifting mechanic overall. The character lineup also feels shallow. The last game, Sonic & All-Stars Racing Transformed, went beyond Sonic to offer Sega characters like NiGHTS from NiGHTS into Dreams and Golden Axe’s Gilius Thunderhead. Team Sonic Racing feels like it needs some much deeper cuts than a roster of 15 headlined by the blue hedgehog, Tails, and Knuckles can offer. I need Jet the Hawk and Wave the Swallow or at the very least the purple-striped feline Big the Cat. Some of these characters could very well be in the final game, but the demo overall felt way too safe and underwhelming without more of these nods to the Sonic universe’s freakshow past.